Having said what I did in my last post here is another perspective! What happened to Hebdo Paris is horrific. Nothing I can add to that to give it justice. 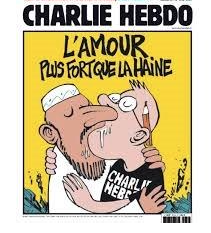 But look at what the comic artists of Hebdo came up with a couple of days later? You really have to take your hat off to them! These are some highly enlightened people, as all comic artists are really, they have a wonderful sense of humor, and having a sense of humor is a divine gift. They should not be stifled or killed by people of darkness and limited intelligence. This entry was posted in Spiritual on 11/01/2015 by mkirtikarphd.